Reset This PC (Windows 10). Reset This PC is a repair tool for serious operating system problems, available from the Advanced Startup Options menu in Windows 10. The Reset This PC tool keeps your personal files (if that's what you want to do), removes any software you have installed, and then completely reinstalls Windows. In Windows 8, Reset This PC exists as two independent repair features under slightly different names - Refresh Your PC and Reset Your PC. More on those below. The word "reset" is often used synonymously with "restart," but they're actually different. See Reboot vs Reset for why the differences matter. Reset This PC is almost always a fix-it tool of last resort. Let's put it this way: Reset This PC is a really big hammer... great for really big nails but probably overkill for a thumbtack. In other words, Reset This PC tool is a fantastic choice when the blame looks to be Windows-related and all other troubleshooting has failed. For example, say you're troubleshooting a major problem after a Windows update and now Windows 10 won't start correctly. You've done everything you can think of to fix the problem, scoured the internet for advice, and you're left with no more ideas. At this point, Reset This PC is your life saver... a guaranteed fix for a really frustrating problem. When a webpage won't load, your wireless mouse isn't connecting, or you haven't even tried restarting your computer to fix an annoying error message, Reset This PC probably isn't the way to go. Keep in mind, as you read above, that Reset This PC removes all of your software, meaning a follow-up task on your part will be to reinstall that software. That's a time consuming task that's well worth it if it means your computer is back to working order but a huge waste of time if all you needed to do was clear your browser's cache. The Reset This PC tools is available in Windows 10 and as Refresh Your PC and Reset Your PC in Windows 8. Windows 7 and Windows Vista do not have repair tools that work anything like Reset Your PC. The Repair Install process, available only in Windows XP, is very similar to the Keep my files version of Reset Your PC. Reset This PC was called Push Button Reset for a short period of time prior to the release of Windows 8. See How to Reset Your PC for a complete walkthrough tutorial of the process, or keep reading for a short how-to. Reset This PC is pretty easy to use. Usually the most difficult thing to figure out is how to get to the right place (Advanced Startup Options) to get it started. One of the easiest ways to get to the ASO menu is to hold down your Shift key while you tap or press any Reset option, available from any of the Power icons you'll find all over Windows 10 and Windows 8. If that doesn't work, see How to Access Advanced Startup Options for help. There we outline six different ways to access the ASO menu, in both Windows 10 and Windows 8. With that many options, it's likely that at least one will work out, no matter what major Windows issue you're working through. Once you're in, tap or click Troubleshoot and then Reset this PC if you're using Windows 10. 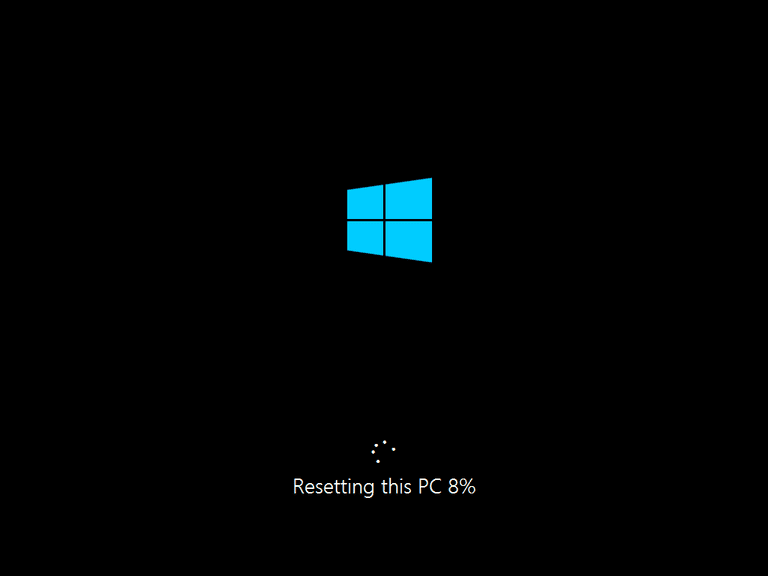 On Windows 8 computers, choose either Refresh your PC or Reset your PC. Choose Keep my files in Windows 10 (or Refresh your PC in Windows 8) to reinstall Windows but retain all of your personal files, like your saved documents, downloaded music, etc. Choose Remove everything in Windows 10 (or Reset your PC in Windows 8) to reinstall Windows without saving anything at all (every installed program will be removed and all of your personal files deleted). This starts you over completely fresh and is identical to the Windows clean install process. On some computers, you may also see a Restore factory settings option. Choose this option to return your computer to the state it was in when you purchased it, which could mean a previous version of Windows if you've upgraded it since then. Follow the directions given to start the "reset" process which, depending on the choices you make, could take as little as 10 minutes or as long as a few hours or more.